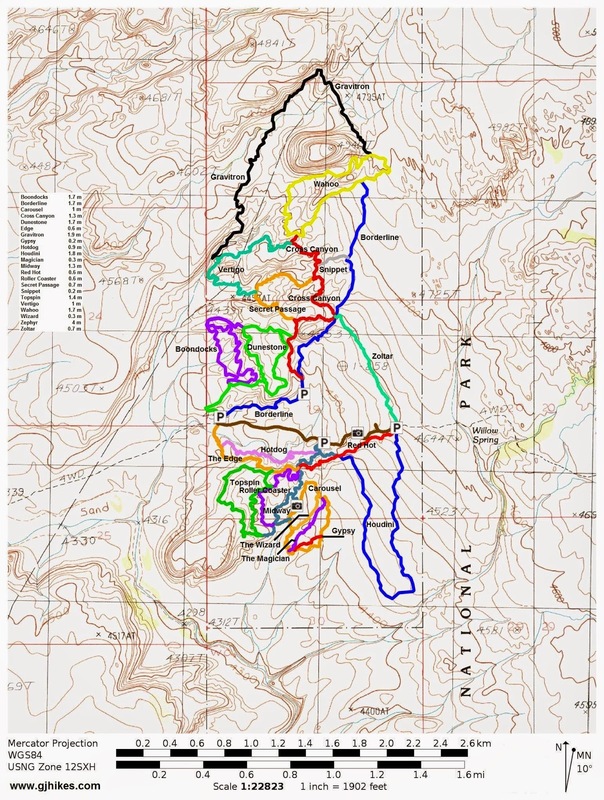 The Roller Coaster trail is located in the Klonzo Mountain Biking Area north of Moab, Utah. The trail begins near the highpoint of the Midway trail and descends down the drainage for over a half mile and rejoins the Midway trail near its southern end. The trail takes advantage of the shoulders of the side of the hill, going up and over each one just like a roller coaster. The trail builders added a few bonus features in the way of manmade bumps where riders can catch a little, or a lot, of air as they follow the trail down the mountain. Just like the Red Hot trail riders can slow down on the bumps and roll over them rather than going airborne. The Roller Coaster is a one-way trail just like the Red Hot. The trail begins off of the Midway trail where the Red Hot trail ends and the Edge trail also makes a connection. 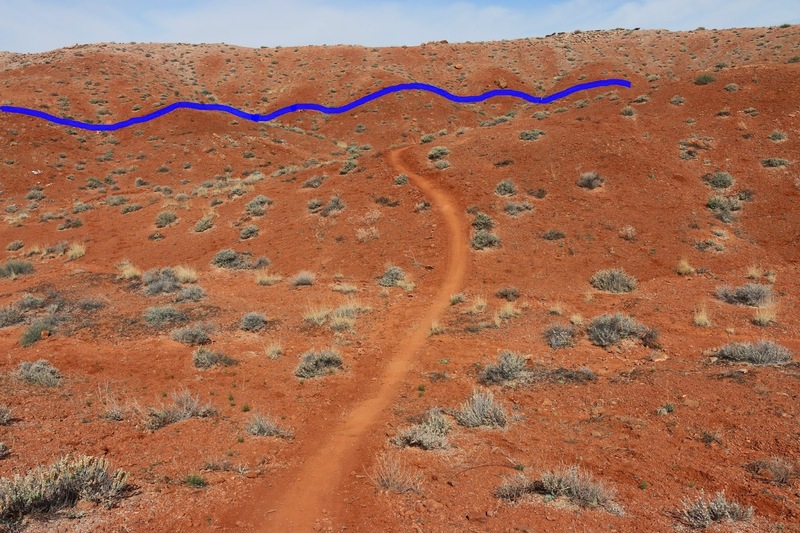 The entire length of the trail is a red dirt singletrack. If you click on the picture you can get a better look at the bump in it but this one is in a downhill part of the trail. Whereas this bump is on an uphill part of the trail. There are several of these bumps on uphill sections and they took a little getting used to at first. Here is a look at one of the areas where the trail rolls over each of the shoulders along the side of the hill. At the 0.35 mile point a short spur leads up to the Topspin trail. From there the Roller Coaster continues doing its thing as it heads further down the valley. I caught a little too much air on this bump and missed the trail on the landing but there were plenty of tracks from others that had done the same thing. The Roller Coaster rejoins the Midway trail and comes to an end. To relax a bit after all of that we took the connector from here that runs over to the Carousel group of trails and rode those next. It was kinda like going from the high dive to the wading pool but at this point the Carousel trails were the only ones in the Klonzo area that we hadn't done yet. As far as the Roller Coaster trail goes it is a lot of fun and if you would like to see it for yourself then all you have to do is grab your bike or 'Take a hike'.